This chapter examines Mike Mills’s Beginners (2010) as a pivotal film that offers a positively connoted and complex narrative focused on an aging gay protagonist. Hess reads the film as representative of multifaceted processes of re-examining and re-claiming LGBTQ history taking place in the early 2000s. The author argues that the film self-reflectively juxtaposes its story of a gay man’s coming out at age 75 in the early twenty-first century with the impossibility of imagining or telling such a story throughout most of the twentieth century. The film exposes the policing mechanisms inherent in heteronormative discourses via its meta-level commentary on memory and on constructing live stories. 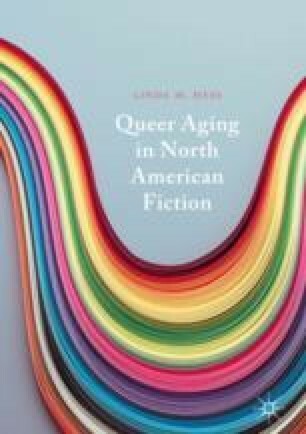 Moreover, it uses its own portrayal of gay aging to demand new and different narratives of queer aging. Hubert, Andrea. 2011. ‘Indie’ Director Mike Mills Is as Happy Shooting for Nike as Sonic Youth. The Guardian, July 16. https://www.theguardian.com/film/2011/jul/16/mike-mills-beginners-thumbsucker. Accessed 26 Nov 2013. Mills, Mike. 2011a. Beginners: Director’s Statement. Focus Features, April 15. http://www.focusfeatures.com/article/beginners_director___s_statement. Accessed 29 May 2014. National Resource Center on LGBT Aging. Background. https://www.lgbtagingcenter.org/about/background.cfm. Accessed 8 June 2018. “Timeline: Milestones in the American Gay Rights Movement.” n.d. PBS. https://www.pbs.org/wgbh/americanexperience/features/stonewall-milestones-american-gay-rights-movement/. Accessed 12 Feb 2016.